The capo can be a confusing accessory to many beginner guitarists. Let’s take a look at what they do. 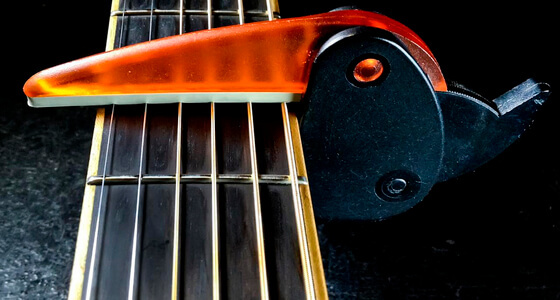 When we place a capo on a guitar neck, it clamps down all the strings at some fret, meaning technically, we have left root position. To understand this, take out a tuner and strike your low E string. If you have put a capo on the 3rd fret, you’ll notice that the low E string is now tuned to G.
If the tuning of our strings has changed, chords that look like root position chords but are played with a capo in place have also changed. This is because the root notes (and all other notes) have moved. For example, if we play the chord that looks like A major with a capo on the 3rd fret, that chord is really a C major, because the lowest note in that chord has moved to C, not A, as it would be in root position. Strum this chord a few times with the capo on, then take it off and play a root position C major chord. They’ll sound the same! Part of the confusion surrounding capos comes from the way we conventionally write chord progressions when using them. Take the popular song “Wagon Wheel” as an example. If you look up the song online, you will likely see instructions to place a capo on the 2nd fret, then play the following chord progression: G-D-Em-C, etc. Convention goes such that once we put a capo on, we name the chords we are forming by the shape they take if they were still in root position. In the case of “Wagon Wheel,” we aren’t really playing a G major chord if we’ve got a capo on the second fret, even though our fingers look like they are forming the exact same chord! We are actually playing an A major chord, because we have moved the G major shaped chord up two frets, which is a whole step, and A is one whole step above G.
So, while the true chord progression for “Wagon Wheel” is actually A-E-F#-D, etc. we often simplify things for the guitarist by naming the chords as if they truly were in root position and not altered by a capo. That’s all for now, Rock on!